Practice is the Key to Crack the English after learning it. So we are here to provide questions from all the sections in the English Language to make your practice worth. After the SBI PO, SBI CLERK & IBPS PO Exams IBPS Clerk will be the most expected one to crack the banking job for many aspirants. 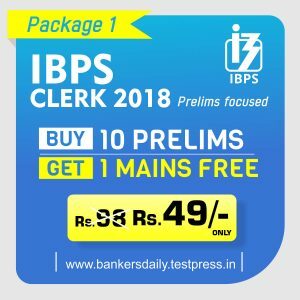 Since IBPS has also changed the exam pattern similar to SBI, we are providing practice sets in the basis of IBPS CLERK 15 Days Study Planner. 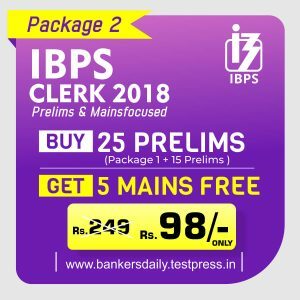 Students are advised to practice the questions regularly and crack the IBPS Clerk 2018 which will be held shortly.Since this will be the dream job for most of the aspirant’s everyone should work hard and act smart to achieve their own destination. Aspirants can find the answers for the above questions here. Q.1) a) Replace ‘country’ by ‘countries’; After the word ‘several’, the noun must be in plural form. Q.2) d) Replace ‘was’ by ‘were’; In a few English sentences which are imaginative in nature, the verb is written in a special way. Here, ‘it’ agrees with plural verb. Q.3) b) Replace ‘are’ by ‘is’; ‘one of the’ is followed plural noun and singular verb. Q.4) d) Replace ‘him’ by ‘his’; ‘his’- possessive pronoun whereas ‘him’-objective pronoun. Q.5) a) Replace ‘accords’ by ‘accord’; Here, ‘findings’- plural subject, so it takes plural verb (accord). Q.6) a) Replace ‘little’ by ‘few’; Few is used before countable nouns and is followed by plural verb. Little is used before uncountable nouns and is followed by singular verb. Q.8) d) Replace ‘few’ by ‘little’; Few is used before countable nouns and is followed by plural verb. Little is used before uncountable nouns and is followed by singular verb. Q.9) a) Replace ‘are’ by ‘is’; Here, the ‘aim’ is singular subject, so it takes singular verb. Thanks. Do attend the Quizzes Regularly. Don’t Forget to Share the Quizzes with your friends too.